This was a real easy custom. I used a Captain America head, and cut off the wings and ears. I used a little sculpty to fill in the holes where the ears were, and filed down where the wings were. Then I painted the head silver with enamel paint. Then I took a naked Doom body, and used some sculpty to cover up his toes. I painted the whole body silver. I "borrowed" the 10" Ultimate Silver Surfer's board, and all done! The board is kind of big, but it seems to fit it with the exaggerated spirit of the Famous Covers. The expression isn't as solemn as the Silver Surfer is usually portrayed, but I figure he's just having a bad day! 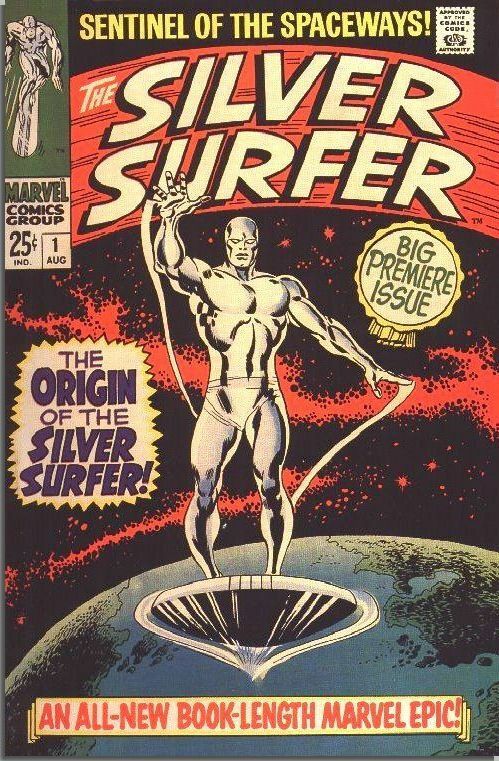 What could be a better cover for this figure than the first issue of Silver Surfer?